Two years ago, just after I bought my first 4"x5" enlarger, I decided to buy a Graflex. My first Graflex was a 4x5" Speed Graphic. Since I had so much fun with it and took a lot of great pictures, I decided to buy a small 2x3" Crown Graphic also. Not only is this camera smaller and lighter, it still gives you the same capabilities as its bigger sister on a smaller film. As I began to clean and adjust this camera I discovered all the possibilities of this simple, but very efficient machine. All of the movements of the bellow create not only different effects, but a new "vision" on the focusing glass. So, equipped with a minimalist bag (2x3" Crown Graphic, a 6x9 roll film back, some TX320 and a small tripod), I started walking on the island of Capri, taking pictures and using all the adjustments that I had experienced while working with the cameras. 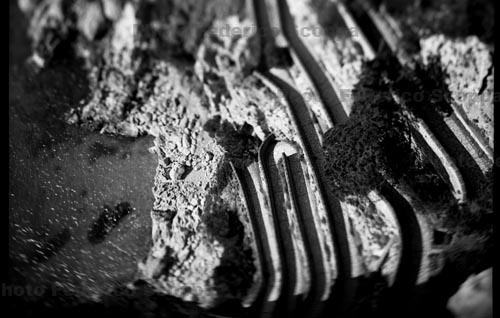 The result of this experiment was that the panoramas appeared different - more suggestive and imposing. 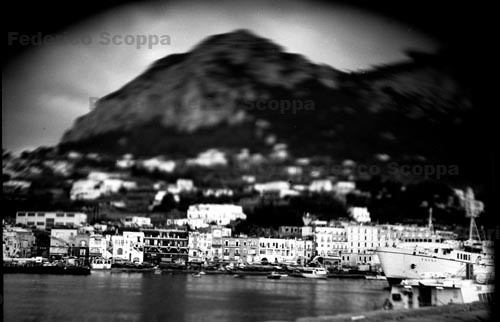 I continued shooting in this empirical manner and the picture gallery "A View of Capri" was born. The potential of these cameras is unlimited. My next experiment will be with the use of a 6x12 roll film back with a 4x5" Speed Graphic fitted with a 90mm lens. Federico Scoppa was born in 1976 in Italy, and lives and works in Napoli. For more of his photos, see "A View of Capri." 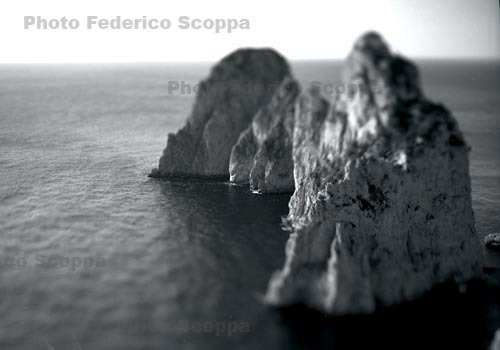 From A View of Capri, Copyright 2006 Federico Scoppa.